Zucchini are part of the family Cucurbitaceae, which I see as small saturated containers of water and mineral salts. It seems that through them nature wants to provide us with all the precious elements that we need to face the summer heat. Zucchini are very versatile and they are available in the market all year round. Personally however, I try not to buy them out of season and wait patiently for those that grow in my greenhouse and are ready in late May. You can make zucchini risotto, pasta sauces, quiches, omelets, and summer soups with them. They are good boiled, steamed, grilled, or sautéed with garlic and parsley and they may also be an ingredient that supports or enhances the flavor of fish and meat. Zucchini are low in calories and therefore lend themselves well to the meals of those who are on a diet. The tart that I propose can be a one course for dinner, cut into small cubes or a delicious appetizer to serve outside in the yard for an aperitif with friends. Cut the zucchini into thin slices. In a pan add the olive oil and a clove of garlic, when the sauce is hot, add the zucchini and season with salt and pepper. Turn the zucchini often using a spatula. After about ten minutes turn off the burner. Butter a baking dish and place in the puff pastry. Prick the bottom of the pastry with a fork. In a bowl, add the zucchini, chopped mozzarella, ricotta, parmesan, and egg. 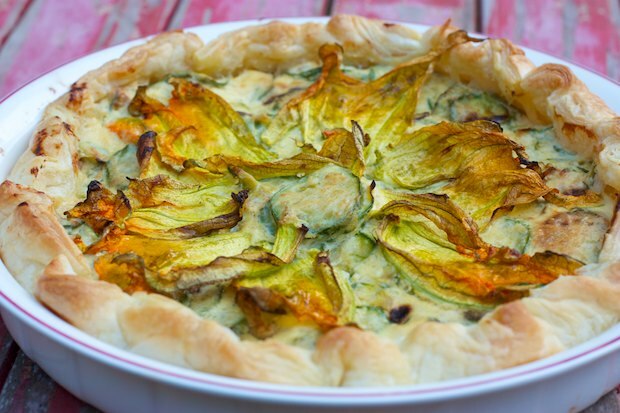 Place the mixture into the base of puff pastry and decorate with zucchini flowers. Bake at 350F for 30 minutes, turning off when a golden crust has formed. This tart can be served either hot or cold.